This is the rainbow that was in the sky yesterday morning. It was a grey, dull, pouring with rain kind of morning and in the middle if it all was this glorious rainbow. This is what it actually looked like - those colours are the true colours, without touch up. I zoomed in, but that's it. I have never seen such a colourful rainbow. Look at how the beams of light have coloured the leaves in the bottom right hand corner. 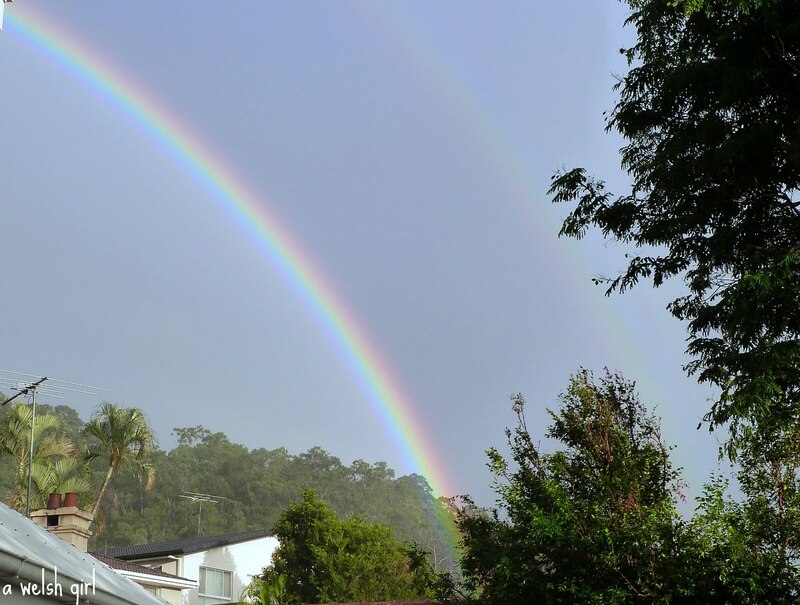 When I looked closely I realised that it was a double rainbow with the dark arc between them, but by the time I went inside to get my camera the second rainbow had faded somewhat. If you look really closely you can just about see it. 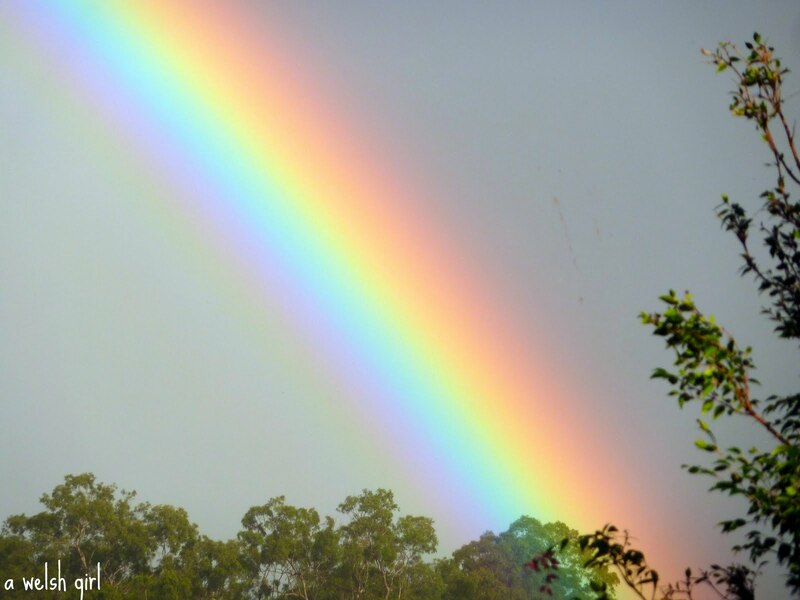 A rainbow in the sky:"
Even through the rain, that sight puts a sparkle in your day doesn't it? Stunning. I think of Kermit "why, are there so, many songs, about rainbows, and what's on the otherside".... with his little banjo. So sweet. oh beth- that is the most incredibly brilliant photo! the edge upon those trees is incredible- almost like a painting! yes...just sometimes the rain does bring something pretty special! Don't often see them as clear and colourful as that here. Hi. I'm from Colorado and randomly stumbled upon your blog. It's been raining buckets here too, unfortunately I haven't noticed any gorgeous rainbows yet. Pretty pictures! Wow, such strong colour in that rainbow, beautiful. What a beautiful way to start my day...gorgeous! !